St Mary's Appeal | With Grateful Thanks...Take Two! With the Archbishop now back from overseas, he was delighted to welcome our biggest group yet of over 100 guests. This was the second of our tours for generous supporters and just like the first; there was an overwhelmingly positive response to the workmanship and design of the new St Mary's Cathedral. There was a great deal of excitement and energy, with many guests commenting that the Cathedral work had been nothing like they imagined and far better than they dreamt possible. Monsignor Keating advised the guests that as at 21 October 2009, our appeal had raised $27.9 million in donations and pledges and confirmed that we need to raise an additional $5.0 million to achieve the dream of completing St Mary's Cathedral. 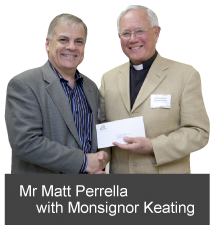 Mr Matt Perrella, Executive Director, Delta Corporation, surprised the Archbishop and Monsignor Keating during afternoon tea by generously presenting a cheque for $10,000 to our appeal. We wish to sincerely thank and acknowledge Mr Perrella and Delta Corporation Ltd for this wonderful support, and for the marvellous job supplying the concrete panelling for our beautiful Cathedral. I also wish to extend my personal thanks to Jason Walsh, General Manager, for all his assistance in making this presentation possible.